I didn’t go to the Democratic National Convention in Charlotte last year However, my friend R.C. Johnson, the chair of the Natrona County Democratic Party, was there and she was even at a meeting of Mormon Democrats (see this article in the Daily Beast which features Grant Hardy). R.C. is not a Mormon, but she was fighting for me and Wyoming. Notice her LDS button! There has been a fair amount of focus on Mitt Romney and his religion. However, I had hoped that the “Mormon Moment” might be bigger than just Mitt. I know that some Democrats in Wyoming were not happy to have a Mormon as their candidate for the U.S. House. However, like Sen. Harry Reid, I am a Democrat because I am a Mormon…not despite of it…something like that. I fully agree with what R.C. said in North Carolina, that for Democratic Candidates to succeed in in place like Wyoming, we must be able to reach out to groups that are not typical Democratic voting blocs. My campaign tried to build those bridges. I also fought against the anti-religion impulse that many on the left have. R.C. was not the only Wyoming non-Mormon friend who attended that meeting about LDS Democrats. Lela, an advisor to my campaign who was working on a campaign in Virginia, made it to that meeting (Lela is now an LDS Dem). Erin, the chair of the Albany County Democratic Party, texted me during the meeting to let me know that she was there and listening to Sen. Harry Reid. R.C. was a rock throughout the 2012 election. Before speaking to the Wyoming State Democratic Convention, that morning R.C. gave me pointers. She said that I needed to hit a home run. I only hit a double or triple, but her coaching helped tons. Since she was the co-parliamentarian of the convention, she was next to podium as I spoke and she was the first to say to that I had done well. In August, after attracting significant media attention for criticizing the Wyoming Democratic who ignored local candidates while contributing large amounts to out of state candidates (large post on that to come), R.C. pulled me aside at a Natrona County Democratic Party meeting and told me that while many were not happy with me, she recognized that I was doing what somebody in my position had to do…particularly in Wyoming. At that same meeting, one of the Wyoming representatives to the Democratic National Committee was going around telling people that I was a “clown.” Knowing that R.C. had my back made all the difference in the world. On election night, I was not surprised to lose. However, the news that Rep. Joe Barbuto (D-Rock Springs) had lost his re-election bid to the state legislature hit my hard. I broke down while talking to R.C. She reassured me that while there was much work to be done, it would be done and that we need to keep sights on the future. That night, I was looking forward to 2014. I am no longer considering a run in 2014 or anytime soon. However, getting to know people like R.C. made 2012 worth it. Tonight, the Natrona County Democratic Party is electing officers for the next two years. I am not sure if R.C. will seek another term or not. Either way, I am going tonight to thank her for all of her work. 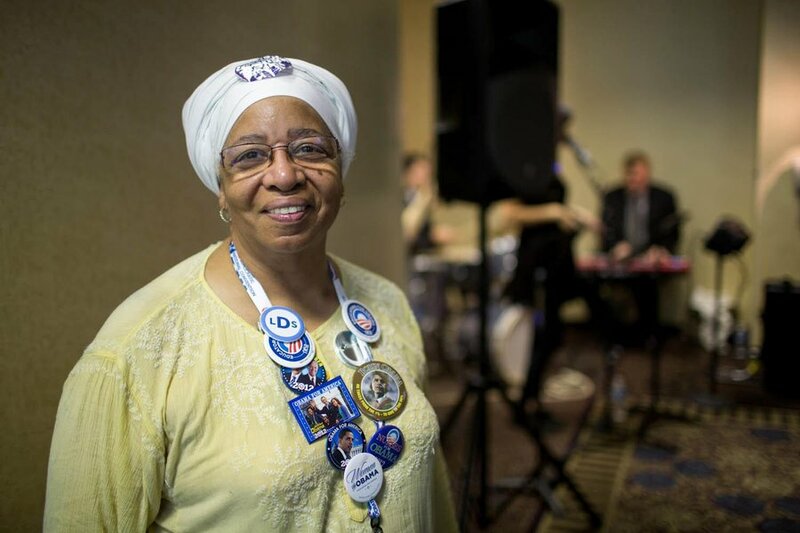 Note: Earlier this week, I wrote about another great county chair. I hate to correct you Chris, but RC was not the vice-chair of the Wyoming State Democratic Convention. She was the co-parliamentarian. Per our bylaws, we do not have a vice-chair at the State Democratic Convention. I stand corrected! The post is now corrected as well. Thanks! Thanks for this post, Chris. I know your election inspired lots of people, and accomplished a lot of good that you will never be aware of. Good on ya! Thanks, Robert! As usual, you are very sweet.